In the midst of war and injustice, the name of Jesus is a scandal. The name of Jesus, then, identifies much more than one particular human being in the strict historical sense, much more than a single child born long ago in a distant land. The name of Jesus signifies the highest aspiration of every human person, the deepest desire of the human heart, the lover for whom we long and in whose absence our hearts are restless. The name of Jesus, given by the Father at the very moment of Mary’s faithful yes is itself a scandal, a stumbling block for the no of the sinner. 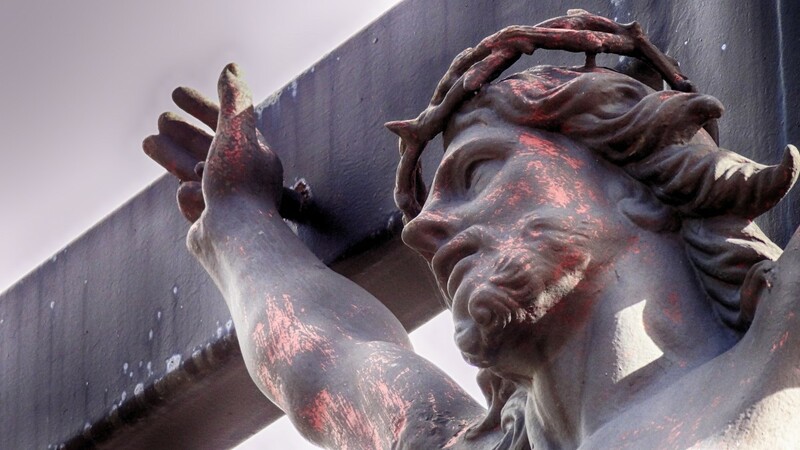 In the midst of war, of injustice, among the callously indifferent and the doggedly unbelieving, the name of Jesus is also a scandal, a name that at once reveals the dignity of every human person and the futility of our this-worldly scheming. Jesus’ earthly parents knew he was special. They could never have imagined, however, that in his name a worldwide church would be born—born in Bethlehem, sacrificed on Calvary, made a sacrament on Easter morning. Throughout the centuries, the saints and martyrs prayed that the name of Jesus would pass their lips as they themselves passed into eternity. This was not pious exaggeration, nor is it charming folklore. It is historical fact. The very name of Jesus gave the saints and martyrs the strength to live their lives of faith. The very name of Jesus gave the saints and martyrs the strength to live their lives of faith. Mary and Joseph could never have imagined the church of today, the church you and I are blessed to call home: a billion people spread across six continents. Today, Christians throughout the world continue to act in his name, demanding an end to violence and injustice. In the face of cancer and AIDS, amid the shadows of life in a culture of death, the church of Jesus Christ—we sinners still called by God—continues to reconcile, to teach, to heal in the name of Jesus. Mary and Joseph could not have predicted any of this. No one had even predicted the events of that first Christmas. Jewish tradition had taught that the Messiah would emerge from the heavens riding a chariot, not in a stable among the hay and dung. The tradition had said that God would make his home in the grand temple of Jerusalem, not in the womb of a frightened, teenage girl. Yet our God—this God who took the name of Jesus—is a God of surprises. As this year comes to an end, we might ponder anew in our own hearts, what surprises God has in store for us. Can we allow this person named Jesus—this God for whom love alone is credible—to possess our hearts in the year ahead? What untruths or cherished myths live within us, waiting to be scandalized by him? What hopes lie there, in our hearts, waiting to be born, waiting for their incarnations, through him, with him and in him? Most of all, what does this God of surprises hope for us, for our church—itself a relatively fragile human body, yet one that still has the audacity to hope in the name of Jesus? This article also appeared in print, under the headline "Of Many Things," in the December 23-30, 2013 issue.